Ameboid is a slimy, Goomba-shaped enemy that can be found at the gate from Smithy's Factory in Super Mario RPG: Legend of the Seven Stars. It has low HP, but if Mario and company fail to defeat it in a single attack, the Ameboid splits into five with the same stats as the original. 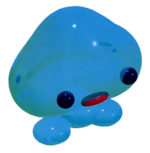 Outside of battle, they are merely small blue spots that become bigger, and only reveal themselves to be Ameboids when they are approached. They are strong against jump attacks and weak against fire. Chester's body appears to be a tan-colored Ameboid contained within its treasure chest-like exterior. Ameboids are named after amoeboids, which are amorphous unicellular organisms in line with the enemy's appearance and behavior (being able to split into multiple individuals). Ameboid walking, view from behind. Puyomēba From 「ぷよぷよ」 puyopuyo (an onomatopoeia for jellylike softness) and 「アメーバ」 amēba (ameba). This page was last edited on August 26, 2018, at 03:18.